Since well before the adoption in December of the Paris Climate Accord, the State Department was angling for a splashy junket in New York for the opening to signature. This will be on Earth Day, April 22. SÃ©golÃ¨ne Royal, French Environment Minister and newly-appointed President of the UN-led climate negotiations, said yesterday that more than 30 heads of state and government have already said they will attend the signing event. She is hoping and working to get this up to 80-100, and I’m sure John Kerry is adding his weight. It won’t match the record 150 of the opening of the Paris conference, and does not need to for what is basically a photo-op with Barack Obama as he rides gracefully into the sunset. The practical interest is whether the UN can reach the target for entry into force on Day 1. This requires signatures by 55 countries responsible for 55% of global emissions. Heads of state and government won’t be going unless they can sign, so the 30 is a fix. But signing can perfectly well be done by a minister with a less crowded diary, or the regular ambassador to the UN. 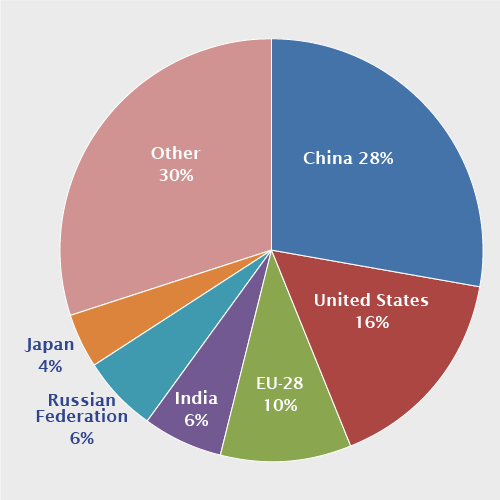 The emissions bar will be just about met if only the US (16%), China (28%), and the EU-28 (10%), making 54%, sign together. It all looks very doable. Watch out if any countries uprate their NDCs. So far they are INDCs, â€œintended national determined contributionsâ€. The final ones will be attached to the signatures. I’ve been pointing out for a while that China and India are outpacing their INDCs on the ground and could improve their offers to general acclaim at no policy cost. Whether they do so on April 22 is a question of PR. As is the whole thing. 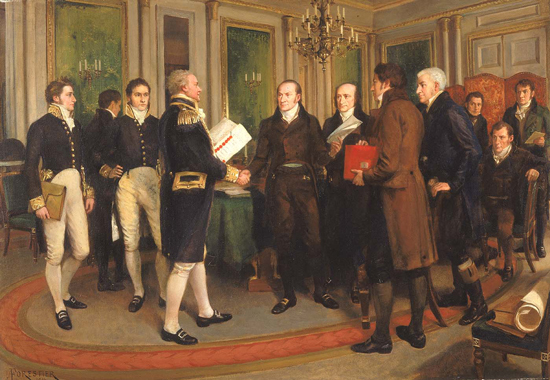 Don’t complain: successful diplomacy has always been a theatre of reconciliation. A successful launch of the Paris Accord will get its machinery up and running, and increase its chances of impact. A pity the wax seal bling has gone. Has Bill McKibben got his big street demo organised? Obama has written his speech. [Update 4 April early:] Report here that the USA, China and India will all sign on April 22. The 55% of emissions will be met with partial EU signatures, and many other countries will speed up not to be left out. However, their instruments of ratification or acceptance will still be in the post. Actual entry into force is likely in the summer or early autumn – before the US election. That’s unusually swift for a large multilateral treaty. More than 130 countries have confirmed that they will sign the Paris Agreement on 22 April, the first day that the agreement will be open for signature …. In addition, more countries have informally indicated that they will sign the agreement, with the numbers increasing rapidly each week. Over 60 Heads of State and Government will attend the ceremony, including French President FranÃ§ois Hollande … A number of countries have also indicated that they will deposit their instruments of ratification immediately after signing the agreement on 22 April. No confirmation from Obama. I assume he was waiting to see if a decent number of other leaders turned up. It’s all looking good for early entry into force. Clinton will be campaigning to defend a done deal, Trump or Cruz to go back on one. The “What about China?” meme will look ridiculous. To state the obvious… they just need to line up some celebs. I am told, that is how the world works now. There must be someone the Chinese and Indian leaders want to meet! I don't know *who* it could be… I just know, there's somebody. Someone their wife or kid likes, etc etc. Oops, no, they're already coming. Good. Who else do we need though? Perhaps there will be a stampede now. Throw in "Hamilton" tickets?